Today’s article is dedicated fot fluorine and closes the halogen cycle, together with iodine and bromine. Fluorine concentration in natural marine water is about 1,3 mg/l and also in our tanks it should not exceed this value with peaks of 2 mg/l, beyond this level corals can be damaged. Fluorine is useful for coral calcification process, indeed it is included in the skeleton as sodium fluoride and calcium fluoride, low soluble and high binding strength molecules. 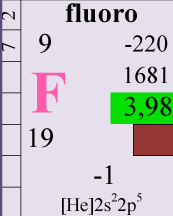 The concentration of fluorine in the skeleton is between 2% and 4%, surely low values but has been proved that higher the fluorine percentage and harder is the coral skeleton. Microscopic analysis confirmed that fluorin atoms act as calcification center around witch calcium carbonate is deposed, in a similar way of strontium. 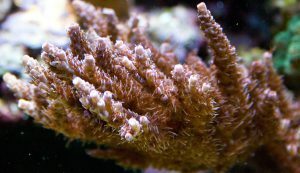 Secondly fluorine has a moderate activity on coral tissue, in which it produce a clearing up, due to the loss of zooxanthellae, or better fluorine makes corals to expel zooxanthellae. Supposedly this behavior is due to the toxicity and high oxidizing potential: fluorine is capable of irreversibly inhibit photosynthetic enzymes. Considering easiness by which fluorine oxidizes other chemical species, it is clear that an excess can cause several damages to all reef inhabitants, in particular it manifests a strong bacteriostatic action, compromising the whole biological equilibrium of the tank. Often we read about the use of fluorine for enhancing blue color on acroporas, personally I have never noticed such an effect. Some years ago I experimented fluorine dosages with both Zymafluor and potassium fluoride. The unique effect I could notice was therefore a general turn to softer colors. For this reason fluorine is useful when associated to other oligoelements capable of enhance pigment synthesis: the synergic action helps corals to lose excess zooxanthellae and produce new chromoproteins. As I stated in iodine and bromine articles, lot of commercial products containing fluorine, also contain a balanced mix of halogens and are very efficient in enhancing colors, obviously best result can be achieved only in oligotrophic tanks. I close with a personal observation: I am a deep water acros fan and I always have in my tanks various species of those awesome corals, in particular acropora suharsonoi and caroliniana. 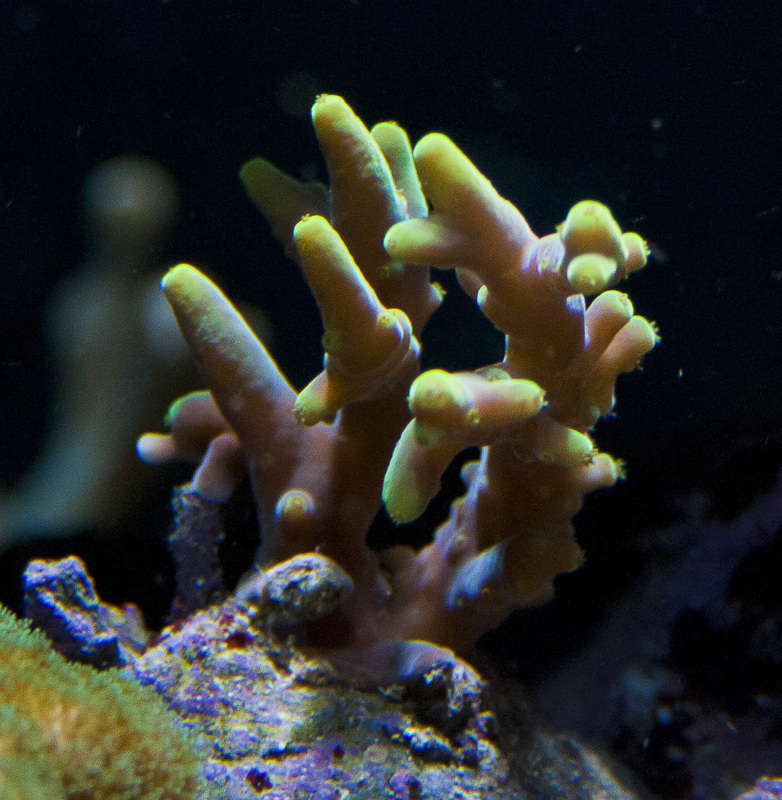 Those corals seem to be very susceptible to fluorine, also minimal doses can produce tissue clearing up and a substantial rise of yellow and green fluorescences under actinic light. I attributed this reaction to the fact that deep water acros have more zooxanthellae in their tissue, since they prefer shdow areas.